If you've been hearing a loud rattling when your heat or air conditioning run, notice a bad smell when they do, low air flow from vents, or any other odd signs, there's a high chance that your duct needs some repairs done. If this is the case, it's important to have it taken care of quickly, as various causes could be draining energy. If there's some sort of blockage from a collapse, it's that much harder for air to get through to stabilize the temperature of the home. This is particularly a concern if you've been noticing rooms that stay cold even when the heaters on, or vice versa. Get Your Air Duct Cleaned! 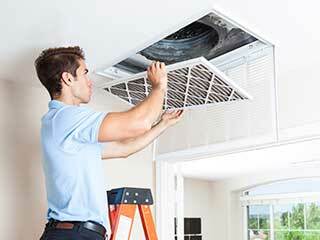 Even if everything is in working order, regular air duct cleanings are a must. They not only improve the quality of your home's air, but they save you on energy costs as well! The dirt, dust, and other substances that get drawn into the duct as it works will build up more and more over time if not taken care of, and these blockages make it much more difficult for air to pass through. Thus, it takes longer for your home to get to a comfortable temperature, and your heating or air conditioning will have to run longer to manage it. This is a huge waste of energy over time, so taking care of the issue regularly will make a big difference. Just like with your air ducts, your dryer vent and duct can become clogged up with lint and other materials over time, particularly if it isn't regularly cleared out. And, just as with the air ducts, this puts a strain on getting enough air through to dry your clothes. Your dryer must run longer until they're properly dry, and energy is once again going to waste in the process. It also happens to be a fire hazard as well, so it's a good idea to have it cleaned periodically in any case! It will help protect your clothes from damage too, so however you look at it, it's a great investment to make.